and intriguing all at the same time and I would recommend that anyone who has the time take advantage of a tour like this. Bikes, booze and dysentery, a recipe for...the experience of a lifetime. 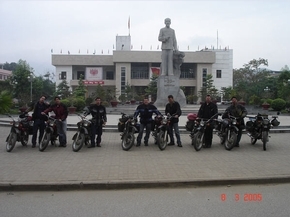 Our tour, through the north eastern parts of Vietnam, was one of the most exciting, culturally enlightening and fun trips that I could ever imagine. If you think this trip might befor you then don't hesitate. Just go. You will eat and drink with locals, witness some of the most beautiful scenery in the world in a part of Vietnam where few others are fortunate enough to go, as well as create a great and lasting bond with the friends who go with you. Again, if you think this is a trip for you, then it probably is and you should go. The scenery in the north is truly amazing - some of the best i've seen in the world. We never saw a westerner for five days. The trip to the rural north part of Vietnam is truly spectacular and gives one a much better insight to the country than just visiting Hanoi or Saigon. The most memorable thing is the hospitality of the people - especially Mr Dang and his five sons! A good suggestion is to get used to hard alcohol before the trip – the northern Vietnamese love to drink!